Josh and I headed down to Chi-town this past week so I could attend a work conference. It was good timing. The weather is finally starting to turn around, it was beautiful, the St. Pat’s celebration was in full swing, green river and all and I was itching to get to a bigger city and do what’s really important–eat. This entry was posted in General Musings and tagged chicago, restaurants, reviews, travel on March 19, 2011 by Lauren. Last night, Josh and a couple friends of ours ventured out into the streets of Canton to experiment with something new and fantastic to us: Indian street food. In Canton? Yeah, I know, right? Now, Indian food is not new to us…I looooove Indian food. And I’m blessed that there’s a few good Indian places in town to eat at, but those are the usual sit-down restaurants. This place, Neehee’s, on the corner of Ford and Canton Center roads, specialized in vegetarian street dishes. I know some of you might be saying, “Vegetarian? No thanks.” But seriously, with flavor and sustenance like this, you won’t even miss the meat. Instead, your stomach will be thanking you with all sorts of contended feelings and sounds. This entry was posted in General Musings and tagged Indian, local, restaurants on October 17, 2009 by Lauren. This is a tale of three adventures. Capers, really. Even shenanigans. Foodie shenanigans. No, that makes it sound more cheeky than it really was. Capers. Definitely a caper. This is a tale of three gastronomical capers. This entry was posted in General Musings and tagged local, market, restaurants, Spices, Ypsi on September 19, 2009 by Lauren. This brownie must be shared with the world. To look at, I mean, not to eat. No, this sucker is mine. It may take a few days, but I’m gonna get it all in my belly one way or another. I am a tigress and it is my wounded antelope. But no, I just wanted to share this. This brownie came from Afternoon Delight, my current favorite brunch place in Ann Arbor. Why are they my favorite? Two words: frozen yogurt. Two more words: For breakfast. Two more words: That’s right. Today is the first day of the fall semester at the university at which I work, and for my department, as well as most others, it’s…well, a crazy day. To top it all off, the heavens are having a serious plumbing problem and it has been raining pretty consistently all day. So already we’re off to a bad start. And then my friend Brian walks in with three of these things, for me and two of my coworkers. And the skies opened, the angels sang. The peasants rejoiced. Anyway, just thought I’d share, and now that you’re all nice and drooly, I’m gonna take my brownie over in the corner and nibble. Hope your day is good, and filled with chocolates. This entry was posted in General Musings and tagged baked goods, chocolate, comfort, local, restaurants on September 8, 2009 by Lauren. Josh and I, fresh from our latest adventure at Eastern Market, were ruminating (I like that word) this afternoon on how we really need to spend more time in Detroit, because there’s so much there that we like and want to do, but we don’t often make the drive over there. Join us this fall for the inaugural Detroit Restaurant Week – a 10-evening showcase of downtown Detroit’s most outstanding chefs and cuisine. The city’s top dining establishments will offer a minimum three-course dinner for a fixed price of $27 (exclusive of beverage, tax and gratuity). Many restaurants are also offering specially-priced wine and beverage pairings to accompany the meal. This entry was posted in General Musings and tagged local, restaurants on September 5, 2009 by Lauren. So we didn’t really wake up until almost 10am this morning. By the time I finished taking our dog Winston on a 2 mile morning walk, breakfast was pretty much a no-go. So Josh and I each downed a bit of fruit and then pondered what to do for lunch. 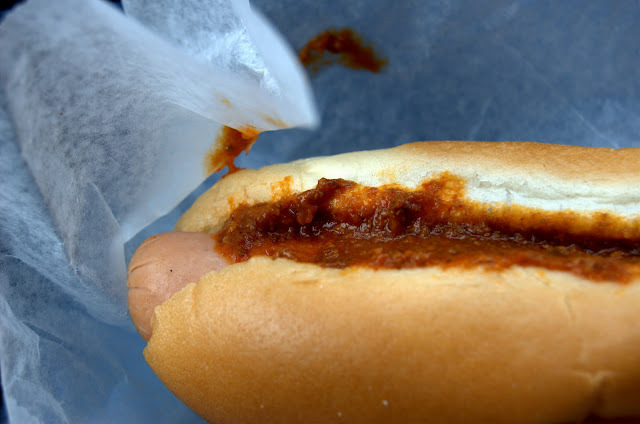 I was already of the opinion that we should have hot dogs, because hey, I’ve been in a hot doggy kind of mood lately. In lieu of trekking to the store, picking up what we’d need for do-it-yourself dogs (I mean, there’d have to be buns and peppers and Josh gets one kind of sausage and I get another and side dishes and eh), we decided on taking the dog for a nice jaunt over to Bill’s Hot Dog Stand in Ypsi. Bill’s is…well, it’s a little yellow shack, really, on Michigan Ave in Ypsilanti (waaay far in Ypsi) around the corner from where I grew up. 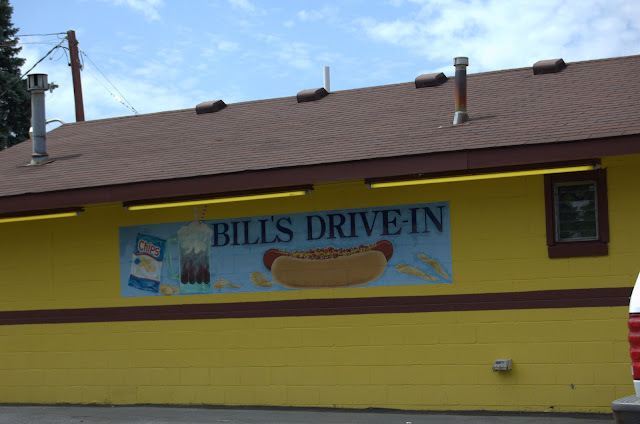 Bill’s has been there…forever, pretty much. My entire life anyway. It’s an old school car-hop kinda place and they mean serious business. They do hot dogs. And root beer. And that’s all they do. Seriously. You can only buy three things at Bill’s: hot dogs, homemade root beer and Ruffles chips. And I will be damned if it is not the best root beer in at least the state, if not the entire western hemisphere. This entry was posted in General Musings and tagged comfort, hot dogs, restaurants, Ypsi on July 11, 2009 by Lauren. The Prickly Pear is a restaurant on Main Street in Ann Arbor that serves southwestern cuisine. Josh and I end up there about once a year, and apparently, we’re one of the few people we know who aren’t stark raving mad about the place. To be honest, we think the food is okay but completely overpriced (and that is saying a lot in this town) and while completely acceptable, certainly not the best Mexican faire in town (not not just because it’s technically southwestern, not Mexican anyway). But we go from time to time because we really want to try like it, and we like to give second chances. One thing I will say is that Prickly Pear has fantastic homemade guacamole, and their tortilla chips are great; I wonder if they get them from Ann Arbor Tortilla? This entry was posted in General Musings and tagged Mexican, restaurants on July 5, 2009 by Lauren. This entry was posted in General Musings and tagged asian, local, restaurants on July 2, 2009 by Lauren.